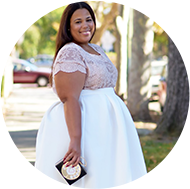 I had the pleasure of having a little girl talk with Ashley Falcon, Plus Size Fashionista, Stylist and New Columinst for Marie Claire. Ashley is clearly very down to earth, personable, and extremely fashionaby creative. I hope you enjoy reading as much as I enjoyed interviewing. GarnerStyle: A lot of the readers have seen your column in Marie Claire. Tell us something that we don’t know about Ashley Falcon? Ashley Falcon: The thing that you don’t know is that the whole "starting of the column" was a fluke. I was interning at Marie Claire and I working late one night couldn’t find my subway card. My boss catches me with purse turned inside out looking for my subway pass and she asks me, “what are you doing?”... So I ended up taking a cab home with my boss. We started chatting in the car and she shared with me that she thought my style was so "chic". I said thank you, because it is a mission for me. I can’t just walk into Zara, H&M, or any of these other chic stores and walk out looking like a million bucks. Then my boss turns to me and says “you are going to pitch the idea tomorrow,” and I respond, “pitch what?” A day later I was in the editor-in-chief’s office, extremely nervous and barely breathing, but it worked out and I am so excited. It is the funniest thing that such a thing as losing your subway card can alter your future. Had I found my subway card, I would have been on the train and would not had the conversation that resulted in the column. There is something to be said about being in the right place at the right time. GarnerStyle: How long did it take the article to be published from the time that you pitched the idea? Ashley Falcon: The time frame was very quick. I took a couple of days to prepare. I pitched the idea and was literally sitting on pins and needles waiting for the editor’s response. A week later, the photo editor called me to schedule a photo shoot for the upcoming column. My response was, “What!?! Upcoming column!?!”. The idea had been approached as a blog or a one time article, but there was nothing about a column. From there, I started working on the column. I was then called up asked if I would like to come to fashion week. I said, “Is that even a questions I’ll be there in 5 minutes.” Since then everything has been like an absolute dream. The column came out and I received such a great response from readers with emails. GarnerStyle: Tell me about your personal style. Ashley Falcon: My personal style is more classic. It is a classic version of everything. I do a little of everything from edgy, to Parisian chic as long as a it is figure flattering. I don’t try to confine myself into the trends that are “in”, because they may not flatter me. I also do not like too much of anything. I don’t like too many accessories, too many layers, and so on. GarnerStyle: Oh my gosh, that is so a crazy. It’s amazing what opportunities a girl and her lost subway card can run into. GarnerStyle: As a fellow fashionista, I think that we tend to keep a secret weapon in our arsenal that we bring out when we really need to give the “wow’ effect. Sometimes it's a favorite designer, sometimes a clothing store, or even an accessory boutique. Do you have a secret weapon? What is it? Ashley: My secret weapons are definitely accessories. I think that right accessories can make any outfit look great. Even jeans and a T-shirt you can throw on a great pair of heels and a hot necklace. It has always been my “go to” because when all else fails you can always count on your accessories. I think shoes are one arena where the plus size girl can compete on an even playing field. We can buy the same Manolos that any skinny girl can buy. GarnerStyle: What would you like see in the plus size fashion industry? Ashley Falcon: I think that is the problem. GarnerStyle: What do you mean? Ashley Falcon: I think that plus size has been made such a niche market where clothes are either only plus size or for the smaller regular sizes. I would love to see the day where I can walk into H&M and have my friend pick up the size 2 dress at the front of the rack while I pick up the size 18 at the back of the rack. Meaning I want to shop in regular stores like everyone else. I long for the day that designers make clothes in larger sizes, instead of separating the skinny line from the fat line. I don’t want to be confined to plus-size stores or to online shopping where most plus sizes are available. Online shopping itself presents the major problem of not being able to try on the clothes. So instead of pushing all fat girls online, we should all be able to coexist in retail stores together. GarnerStyle: Where do you shop? Ashley Falcon: I don’t constrict myself to strictly plus size stores. I personally love H&M & Zora. It may just require me to try on 100 things before I find something that works for me. I also love Target and even have got some pieces from Forever 21’s plus size line Faith 21. What I did like about their line is that they brought a lot of the same pieces from their regular sizes to the plus size. Some of the pieces didn’t translate well into plus size, but some of them did. GarnerStyle: Can you give us one piece of fashion or styling advice? Ashley Falcon: The best piece of clothing is the piece that makes you look amazing. With that in mind, don’t give up and don’t sacrifice on fit and quality. Clothes need to fit and flatter. Don’t put on a poofy skirt or a pair of harem pants because they are trendy. Get something that flatters you. Trends tend to fuel our guilty pleasure whether the guilty pleasure looks good on us or not. Everyone is allowed a couple of guilty pleasures, not a whole closet full. GarnerStyle: What should we expect in the future for Ashley Falcon? Ashley Falcon: There are a lot of things on the table as far as the magazine is concerned so we will just have to wait and see what happens. In the years to come, expect to be surprised. I want to write a book, be an editor of a major magazine and have my own show. Anything that I have the opportunity to do I want to do. I would again like to thank Ashley Falcon and Marie Claire for granting “The Curvy Girl’s Guide to Style,” this exclusive interview. Marie Claire is definitely doing something revolutionary in the fashion world with the recognition that there is a plus size consumer that one that has both a love for fashion and is a consumer that has really been ignored by the fashion world as a whole. Ashley’s column can be found monthly in Marie Claire. I hope you will be reading, because I sure will. WOW @ how she walked into that position with her boss!! How exciting! Nice interview. I'm excited to see what she does with her column. omg i got in touch with ashley to do an interview with yff too! lol, she is great! great interview! This was a wonderful interview and inspirational one, at that! I'm glad I found out about Ashley, because I really don't have the time to keep up with magazines...so thank you.